Do you ever take the time to look at the ingredients on packages of seasoned or sweetened almonds at the store? Do you know what all the ingredients are in them? Do you know a lot of them contain MSG disguised under a different name? Heck some of them don't even try to hide it and come right out and put it on the label but not near as often anymore. If the snacks you buy at the store say things like "natural flavors", "yeast extract," "hydrolized" something or other......you don't want it because it more than likely contains MSG. And even if it doesn't have MSG you don't want all that nasty table salt do you? And again who knows what else. Go on try it look at the ingredients next time you are in the store. You will see what I mean. But who doesn't love a good crunchy snack! And you have been grabbing those almonds and other nuts cause they are so much healthier then say chips and other things aren't they!!!!! Well here's the thing they may be a better option and there are ones with better ingredients all the time but have you looked at how much they cost? Why not make sure it has excellent ingredients and save you a whole bunch of money by making your own! And hey while you are at it soak and dehydrate them first to give them a awesome enzyme boost. 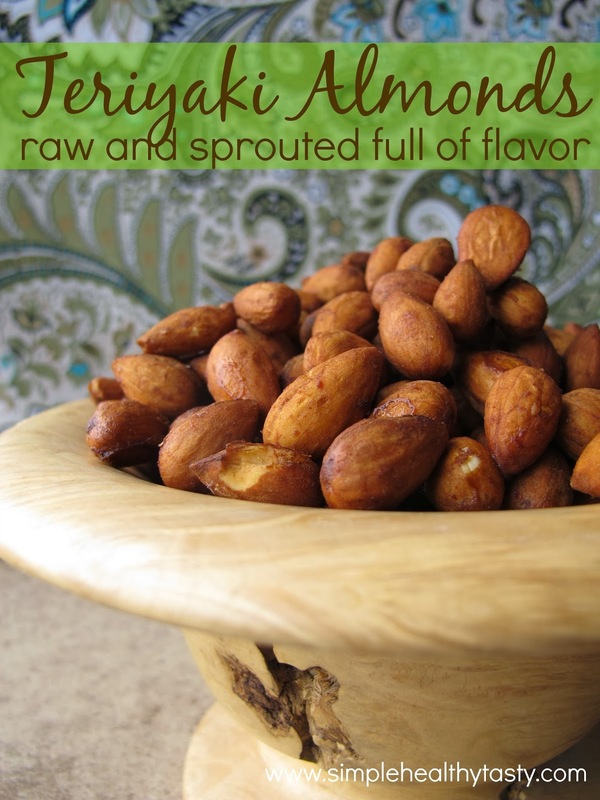 If you are not into or get tired of Teriyaki flavor try out these fun Seasoned Almonds or want some sweet try these Candied Almonds. 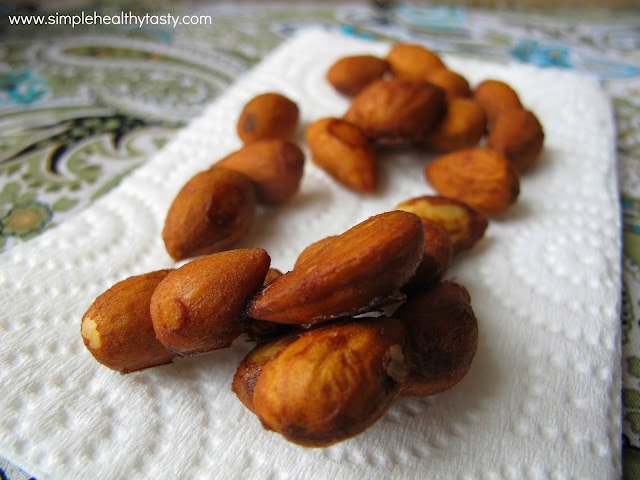 Great snacks for anytime and fun to have around for the holidays too! Blend everything but almonds in blender until smooth. 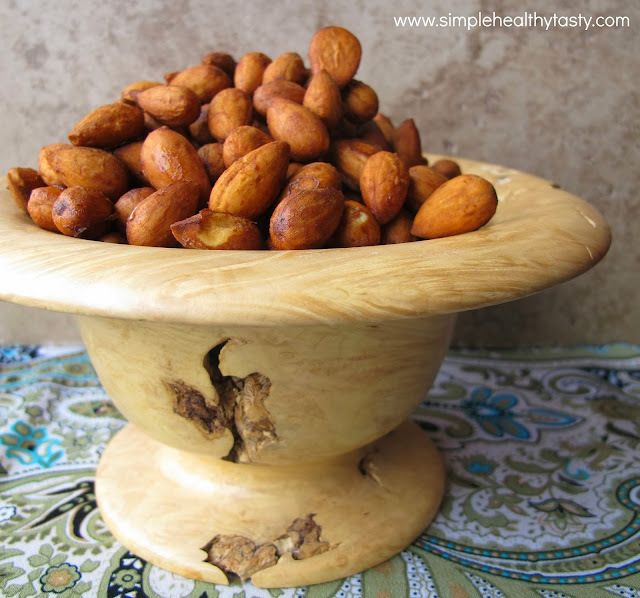 Add almonds and blended mixture to a large bowl. Stir well and let soak for at least an hour stirring once or twice during that time. Lay almonds out on dehydrator sheets and dry at 105° overnight. Take removed from sheets and flip over and continue to dry until dry and crunchy. Note: A one gallon bag full of raw unsoaked almonds is about 5 pounds.